Gerasim Lebedev, one of the founders of Russian Indology, was thought of as something of a vagabond, a dreamer whose obsession verged on insanity. He was one of the earliest advocates of Indo-Russian cultural cooperation. Russian composer, linguist, translator, poet, dramatist and theatre director Gerasim Lebedev was destined to discover many of his multitude of talents in India, a country to which he seemed to be drawn by fate. Lebedev today is known as one of the founders of Russian Indology but, during his lifetime, he was thought of as something of a vagabond, a dreamer whose obsession was verging on insanity. Lebedev was born in 1749 into the family of a preacher in the Russian city of Yaroslavl. His youth coincided with the reign of the famous ruler Catherine the Great. Although millions of imperial subjects lived in conditions of slavery, as serfs, talented ‘rough diamonds’ among the peasant population were often able to make the step from slave to independent human being. Our hero was one of the lucky ones. At age 15, Lebedev moved to St. Petersburg, where he quenched his thirst for new knowledge. He taught himself to read, took an interest in music and learnt to play the cello, an instrument that was never to be far from his side for the rest of his life. As a court musician for the Russian Embassy he was able to travel abroad for the first time, giving concerts in a number of European cities. Rumour had it that Austrian composer Joseph Hayden was deeply impressed by the talents of the Russian cellist. But the social whirl was not enough for the young musician; Lebedev longed to get out of Europe and head East, towards India. Russians believed India to be the cradle of humanity, the place where civilisation was born. Lebedev dreamt of acquiring ‘ancient wisdoms and secret knowledge.’ But Russians only had a dim understanding of what India actually was. Afanasy Nikitin’s travel notes were still unknown, and so, like his predecessor, Lebedev was heading into completely unknown territory. In February 1785, carrying his beloved cello, Lebedev boarded an English ship sailing from Portsmouth to the shores of India. From then on, Lebedev’s life took the form of an adventure novel. After six months at sea, the Russian traveller disembarked in Madras, one of the biggest colonial administrative centres in southern India. He stayed there for two years, playing music to earn his living. He used the time to learn the local language, Tamil, and made many attempts to find a teacher of Sanskrit. One of Lebedev’s dreams was to learn the ancient language. But his first attempts were futile: the spiritual elders, the Brahmins, didn’t want to reveal secrets as precious as these to a foreigner. 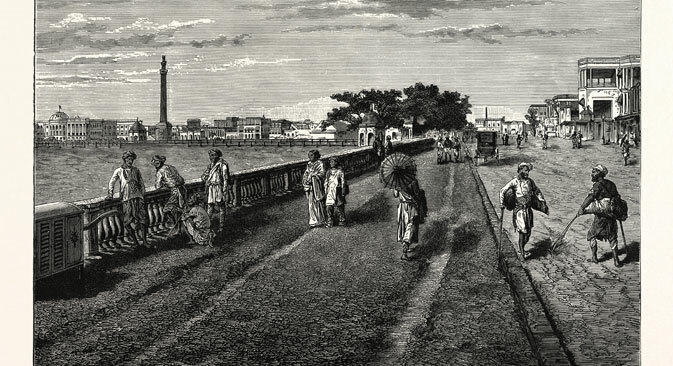 From Madras he moved to Calcutta – the capital of British India. This was reputed to be the place for entrepreneurs, for people seeking adventure and contacts. Lebedev was to spend the next ten years of his life there. Having fallen in love with Indian culture, Lebedev started to write his own music, inspired by both European and Eastern motifs. He was the first to fuse Indian melodies with Western musical instruments. In his third year in Calcutta, Lebedev had his lucky break; a school-teacher agreed to teach him Sanskrit. Lebedev also started to take lessons from him in Indian mythology, arithmetic and astronomy, and dedicated himself to learning Bengali, and the Calcutta form of Hindustani. When he wasn’t studying, Lebedev found time to translate two comedies from English to Bengali. He transferred the setting of one of these plays from Madrid to Calcutta, giving all the heroes Indian names. It was at this point that the Russian was gripped by an ambitious plan to perform this play on the Indian stage. The idea was ambitious because, in the 18th century, national theatre was yet to be developed and consolidated in India. Popular performances at the time took the form of public readings of ancient epic stories, but professional theatre was yet to appear in India. Of course, English ex-pats would perform in the theatres of the East India Company, but they were performed in English, for English audiences and with exclusively English actors. Gerasim Lebedev set out to start a theatre designed for the local audience. Of course, the theatre performances had to be approved by the strict Brahmin censors, and also be sanctioned by the Governor General. But the English had no idea that Lebedev’s troupe would pose such serious competition. Lebedev immediately rented and renovated a building with a stage and a hall for 400 spectators. He drew the stage decorations himself, and put together a repertoire of Indian folk dances and songs. His company consisted exclusively of local actors, including – horror of horrors – female actresses, who had previously been forbidden from the stage. Lebedev showed himself to be an excellent PR manager – putting adverts in the local paper, painting bright notices all over town in both English and Bengali. The first performance met with roof-raising applause. The Indians were bowled over by it. The theatre was not nearly large enough to accommodate all those who wanted to see the play. The new ‘magic theatre’ were the words on everybody’s lips. The Russian and his followers started to stage more performances, and the popularity of the Russo-Indian co-operative raised serious concerns amongst the English rulers. They raised every possible obstacle to stem the progress of the ‘Russian upstart’. Eventually the English planted a set painter, Joseph Battle, to ruin Lebedev’s theatre from within. Battle told a false sob-story about having been unjustly fired from the English theatre. Lebedev took pity on the devious set decorator, who was offered a job and soon became Lebedev’s business partner. Battle got rid of the best actors, secretly ruined the set decoration and even started a fire. But his most damaging action was to spend huge amounts of money, eventually bringing the theatre to financial ruin. Lebedev became bankrupt and almost ended up in jail because of his debts. The Russian had nothing left to do but ask the British bureaucrats permission to leave. With tears in his eyes he waved goodbye to this wonderful country and its hospitable inhabitants. Lebedev lived to the age of 68. He dedicated his final years to teaching his peers about the wonders of India. He translated the verses of the outstanding Bengali poet of the time, Bharatchandra Roy, compiled a Russo-Hindustani dictionary and a ‘grammar of Eastern dialects’ and wrote a large book about the culture and religions of India. At his home he made a special printing room, where he stored equipment to recreate the Bengali script. Lebedev printed the first book in Russia, and actually in all of Europe, to be written with Indian letters. To today’s readers Lebedev’s works appear somewhat naïve and even inaccurate, but he made a huge contribution towards drawing the two nations closer to one another. The epitaph on Gerasim Lebedev’s gravestone reads: ‘He was the first of the sons of Russia to penetrate into Eastern India and, having taken on the morals of the Indian people, he took their language to Russia”. In Calcutta there is a street named after Lebedev, as this was where the Russian musician spent an important part of his life, a place where he earned the love and respect of the local people, a city where he is held in everlasting esteem. The article was first published in 2013.